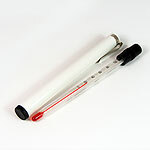 This glass simple and easy to use thermometer is ideal for general use with its wide temperature range. This pocket thermometer also includes a case to protect the glass from damage. Excellent service and product that I was struggling to find. Delivered within a couple of days..excellent service...well packaged.